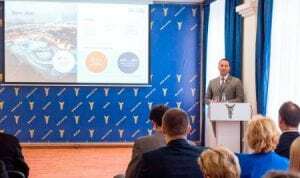 Dubai, UAE: The Dubai Chamber of Commerce and Industry recently participated in a seminar held in Minsk, Belarus, where representatives from the Chamber’s Azerbaijan office highlighted the business potential that Dubai can offer Belarusian food exporters. The seminar, organised by the Belarus Chamber of Commerce and Industry, aimed to familiarise participants with guidelines governing halal food products that are exported to the UAE. The event was attended by officials from the Belarusian Ministry of Agriculture and Food, Emirates Authority for Standardization and Metrology, and several Belarusian food exporters and other companies that are keen to explore business opportunities in the UAE market. During the seminar, representatives from the Chamber’s Azerbaijan office delivered an informative presentation covering growth forecasts for the UAE’s food sector and various competitive advantages that Dubai provides to food exporters around the world. Mr. Omar Khan, Dubai Chamber’s Director of International Offices, explained that Dubai’s ideal geographic location provides easy access to a consumer market of approximately 2 billion people. He pointed out that the emirate already serves as a strategic gateway and re-export hub with strong links across the Middle East, Africa and Southeast Asia. “Global food manufacturers are increasingly making Dubai a key part of their expansion strategies as the emirate is home to a fast growing population, while efforts have intensified to boost food security in the UAE in recent years,” said Mr. Khan. He added: “We have seen strong interest from food producers and exporters in Eurasia that are very keen to cooperate with Dubai on food security and use the emirate as a re-export hub to reach surrounding markets. There are countless business opportunities in the Dubai market that Belarusian companies can greatly benefit from as the emirate is constantly looking to diversify its source markets. Halal meat and green tea are among the fastest growing product categories in the UAE, according to recent data from Euromonitor International. The value of halal meat sales in the UAE is forecast to grow steadily to AED 8.3 billion this year and rise further to AED 10.2 billion by 2021, indicating growing consumer demand for these segments. Dubai Chamber’s representative office in Baku serves as a gateway for Dubai-based companies to explore business opportunities in Azerbaijan and other promising Eurasian markets. At the same time, the office aims to facilitate trade and business relationships between companies in the region and their counterparts Dubai.